Besides the Lumia 950 and 950 XL flagship devices, Microsoft also announced a budget Lumia 550 device. The Lumia 550 sports a 4.7inch display 720p AMOLED display which is kind of impressive considering the price of the device. The Lumina 550 is powered by a Qualcomm Snapdragon 210 processor with 1GB RAM, and will come with 8GB of internal memory which can be expanded via a microSD card. The optics on the Lumia 550 is a 5MP back camera and a 2MP front camera. And all this will be powered by a rather small 1905mAh replaceable battery. The Lumia 550 is expected to cost about $139 when it is finally available for purchase. 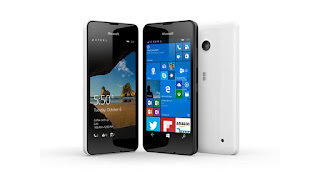 The Lumia 550 will a dual SIM version.